Added by sajolida about 3 years ago. Updated 3 months ago. It has many problems and we could use Icedove instead. Let's use this one as meta ticket. That's the string sajolida and I came up with on XMPP today. 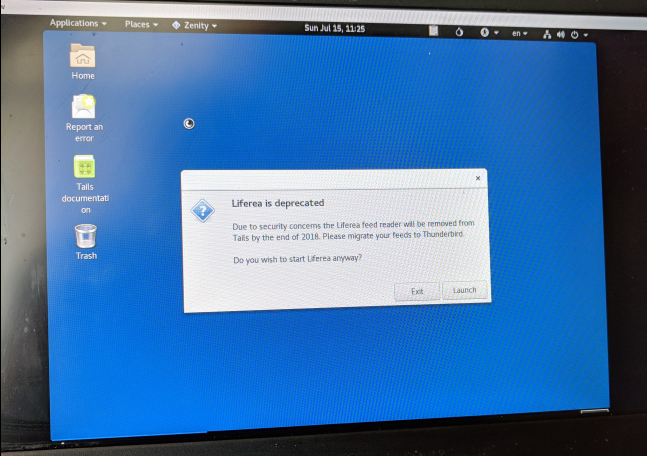 We're seeing issues in 3.0~betaN with Liferea, and we prefer spending our time moving to Thunderbird instead of debugging Liferea. Looking at your 3.2 plate, I suggest you postpone this to another major release. We don't document Liferea usage anywhere. It's only mentioned on our doc/about/features page. We have no persistence setting for Liferea, so if anyone uses it seriously, they have to add a custom persistence setting. But we have a persistence setting for Thunderbird. We have had concerns for years about the safety of Liferea because it's essentially another browser we ship, with JS enabled by default (#9429) and merely running it with torsocks is not enough to make a web browser anonymous. On Thunderbird with Torbirdy, by default only text (not HTML) is rendered which is safer. Users can enable full HTML rendering in Thunderbird too, but at least the default configuration is safe. I've not heard anything about Liferea from our help desk for many years. I seriously doubt anyone is using it in Tails currently. 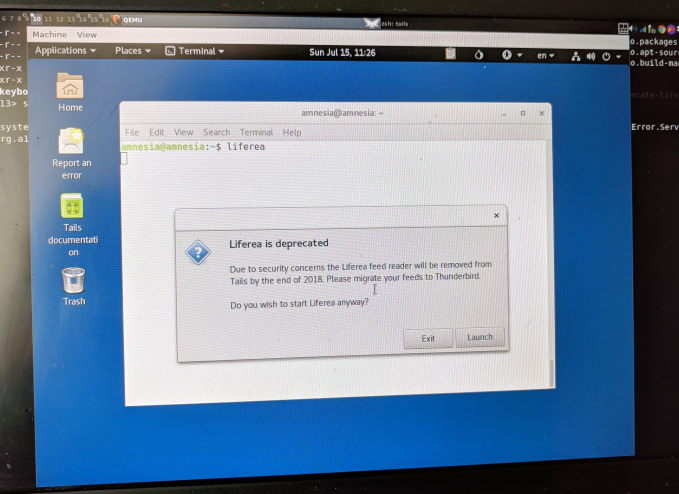 The only person I know who uses Liferea on Debian Stretch, wrapped with torsocks just like we do, sees it crashing (segfault) every 15 minutes or so. Likely there's something Liferea dislikes about being run in a torsocks environment. I suspect Tails is affected just the same but nobody noticed. A few of us are using Thunderbird (in Tails and outside) for their feed reading. AFAIK they're all happy with it. Years ago we decided to focus on this very ticket instead so we've left numerous Liferea issues open, e.g. #8793 and #9989. Thunderbird does not suffer from these bugs. 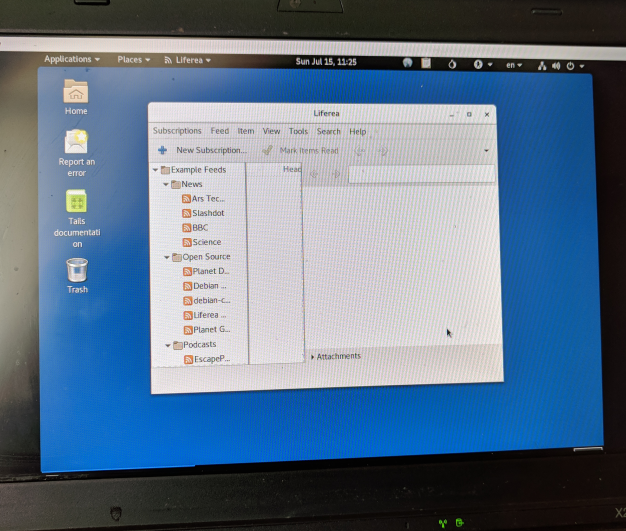 Most of the research we wanted to do on #7626 has been done, and https://trac.torproject.org/projects/tor/wiki/torbirdy#IsitsafetosubscribetoRSSfeedswithThunderbirdandTorBirdy now says "Is it safe to subscribe to RSS feeds with Thunderbird and TorBirdy? → Yes, RSS support was added in TorBirdy 0.2.0." To sum up, it seems that Liferea support in Tails is poorly integrated, unmaintained, buggy, unsafe by default and probably unused. The current state of Thunderbird support for feed reading in Tails is already better than that on all these counts. in Tails 3.6 (March 13) we stop shipping Liferea, drop it from the list of features, add feed reading to the list of Thunderbird features on doc/about/features, and close #7626. Then #7625 can be repurposed into "Modify the description of the Thunderbird persistence setting to mention feeds" (not a blocker IMO). Added to the monthly meeting agenda. If we reach an agreement I'll implement this for our next major release. which (approximatly, sorry for the broken english) says: "In the audit security problems in connection with RSS-Feeds have been detected, which likely only will be fully fixed in thunderbird 59. the attack vector won't be described in details because of security concerns. The usage of RSS-Feeds in thunderbird can reveal and endanger your confident communication in thunderbird as well as other sensitive information"
which translates to: "Don't use RSS-Feeds in thunderbird for now. There are serious security problems, which could endanger the confidentiality of your (end to end encrypted) communication." The "Kalender, RSS und andere Funktionen mit Rich-Text" wording suggests that the problems come with rich-text, so with the default Torbirdy settings (only the plaintext of RSS feeds is fetched and displayed) we should be safe. But there may be other, critical security problems with RSS feeds, so let's be careful: even though it's likely that Liferea is affected by similar problems (see e.g. #9429), we're not in a big hurry. in the first Tails release that switches to the next Thunderbird ESR (likely 60), that will have the fixes this article mentions: we stop shipping Liferea, drop it from the list of features, add feed reading to the list of Thunderbird features on doc/about/features, and close #7626. In the first Tails release that switches to the next Thunderbird ESR (likely 60), that will have the fixes the Posteo article mentions: we wrap Liferea to display "Liferea is going away, please migrate your feeds to Thunderbird"
In the following (N+1) release or N+2, we remove Liferea, drop it from the list of features, add feed reading to the list of Thunderbird features on doc/about/features, and close #7626. I don't think we'll have Thunderbird ESR60 in Tails 3.7: #15091#note-18. Self-assigning ticket during meeting on tails-meeting with nod from intrigeri. Adding 1 hour to estimate/max-time. See the prior art in unsafe-browser and electrum. Patch attached. Can also be found using the 11082-deprecate-liferea branch on https://github.com/lamby/tails. The wrapper does not apply to Liferea started via D-Bus activation: /usr/share/dbus-1/services/net.sourceforge.liferea.service has Exec=/usr/bin/torsocks /usr/bin/liferea --gapplication-service. If we don't expose ways to trigger that to users, fine. If not, it'll be a tiny bit more involved since we already patch the .service file in config/chroot_local-hooks/09-torsocks-apps. I'll quickly check it. The "Due to security concerns the Liferea RSS reader from a future […]" sentence is broken. I'll ask our in-house GUI designer to tell us what the string should be. lamby, do you have budgetted time left to fix this? I think I would use a config/chroot_local-patches/ to s|/usr/bin/liferea|/usr/local/bin/liferea| and then let the unmodified config/chroot_local-hooks/09-torsocks-apps code handle the torsocks wrapping. It won't be pretty but that's a temporary wrapper anyway, it'll get removed in Tails 3.11, so whatever works. sajolida and I came up with a good string and I updated my branch to use it => case closed. Ick, urgh, blarghg, I'm really sorry for screwing up twice in one week and wasting your time here. This is pretty unprofessional of me and I can only apologise. I feel pretty crappy about this now... I had been "half" testing these changes on the command-line in a booted Tails instance and then copy-pasting scripts back and forth, rather than generating a new ISO and testing everything from scratch. Naturally, this can lead to errors, omissions or missed changes, as I have discovered when hacking on d-i.. I now plan on testing this properly (as you describe...) but I cannot this evening as I am about to head out. However, I do believe (and again, half-tested!) the fix is https://github.com/lamby/tails/commit/9d97257028f0bdecbcd33ab0a01eeefc10d27a5d.patch, or at least that is what I plan on testing first. I had been "half" testing these changes on the command-line in a booted Tails instance and then copy-pasting scripts back and forth, rather than generating a new ISO and testing everything from scratch. Sorry for the delay but I had some fun getting my local Tails build environment up and running. Code review passes, it seems to be the obvious fix and I trust your test results => merged into devel! Thanks. I'll track the next steps. The part of this that's for 3.9 is well tracked in subtasks. Once that's done, the only remaining thing will be #15776 which is scheduled for 3.11. Let's do this in a major release.